It is a pleasure to welcome author Mary Brock Jones, author of Torn. Welcome Mary to The Adventures of the Everyday Fangirl and thanks so much for taking the time out your busy schedule to help us get to know you and your story better. 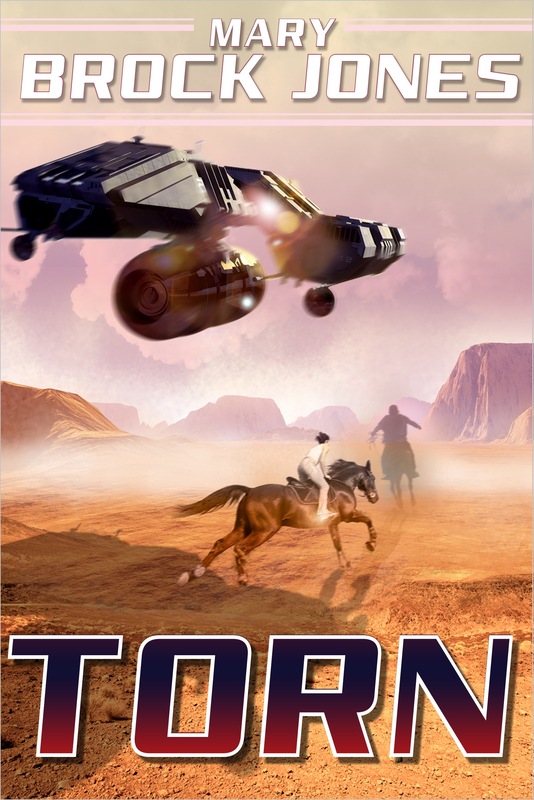 The title is “Torn” because so much is being torn asunder in this book, or threatened to be. The environment of the planet Arcadia, the living, breathing heart of the world that gives life to the human inhabitants, is near to being physically torn apart thanks to the settlers’ actions. If nothing is done, and very soon, there will be cascade of environmental catastrophes putting at risk the continued existence of humans on Arcadia. The hero and heroine are torn between multiple loyalties. To save their world from environmental collapse, they must betray the families they love. There is something between them, something they cannot deny, but they come from very different parts of the planet and each has a love for their unique but quite opposite homelands that is an intrinsic part of who they are. Can they resist this growing attraction between them, one that must result in exile for one or both? Further, do they really trust the organisation they work for, the government department bent on saving their world, and for which they have put at risk their families and agreed to change those very lands they love. The actual names are not significant, but the two main characters use different language roots. The hero, Caleb’s, family names are all very short, very old English type names, whereas for Fee, the heroine, her name is broadly based on a kind of Scottish Celtic – very broadly, that is, with a huge amount of leeway for which I hope I am forgiven. I do have Scottish ancestry and last year visited the area of Scotland my grandparents came from, which is part of why I picked it. Also the fluidity of the sounds seemed to match the nature of Fee’s relatives. The hero’s name is Caleb Winter – short and brief, a reflection of the man and the society he comes from. The heroine’s full name on the other hand is: Fioruisghe ingh Bram an Scathach den Coille. Fioruisghe, daughter of Bram and Scathach of the family Coille, a reflection of the importance of family ties and formality of address among her people. She is more commonly known as Fee when working away from home, but her family and people never use the shortened form. I’ve always loved romance and science fiction, so the combination suits all parts of me. I get to write about relationships and indulge in world building – bliss! I grew up on Anne McCaffrey, and love the works of Lois McMaster Bujold, Catherine Asaro and the Liaden series of books by Sharon Lee and Steve Miller. But I would have to say it was Catherine Asaro’s Skolian series that inspired me to write this book. The idea for it actually came up in a workshop she gave some years ago at an SFF conference in NZ and I just love the characters and relationships in her books, along with the serious understanding of physics that underlies them. As for the ecological aspects of this one, that probably harks way back to the sense of excitement I felt when I first discovered Frank Herbert’s “Dune”. Oh dear – not sure that being a writer and remaining sane go together! I do admit that all of my characters are reflections of the various parts of me, which probably means that I’m mixed-up crazy deep inside. I know I have to write regularly; it’s almost a physical need, otherwise I become decidedly twitchy. My background is in the biological sciences, so the ecological parts of this book were just an extension of that, but I had to also find out about meteorology and the geotechnical aspects, which were decidedly challenging. I think there is always something unique to be researched for any book—it’s a big part of the fun of world building. My previous books had me delving into NZ history, coming up with a plausible futuristic legal system, and figuring out possible methods of increasing the efficiency of energy transmission. Human foibles, the quirky things that happen, irony and double meanings. I’m useless at telling jokes though. Anything to do with the loss of a child – I can’t imagine ever being able to put that in a book. A sad but beautiful movie, weddings, whenever any of my sons do something amazing. I’m that blubbery mother at graduations, weddings, grandparent christenings, you name it. Events that take me back to childhood – a Scottish pipe band marching in a parade gets me every time. Science fiction, romance and history, hence why I write romantic scifi and historical romance. I loved the ‘Firefly’ series, and books such as Catherine Asaro’s Skolian series, Lois McMaster Bujold’s Vorkosigan series, all of Anne McCaffrey’s works (not just the Pern ones), Robert Silverberg’s stories for their characters and the way he created new societies. I love music of many types, but particularly folk and the new rock folk, country, classical, and any dance music. I also love any kind of dancing, (still do, but only in very private places! ), and always wanted to learn ballet as a child. We had a big family and lived in the country so it wasn’t possible, but dreams are still free. I think that love of dance comes through in the physicality of my characters. How they carry themselves is always important to me. Caleb is very upright, with a slow, easy way of walking. He’s a kind of cowboy character, so that suits him. Whereas Fee is a person in constant motion, happiest in her tree tops when she can become one with the swaying of the branches. Again, thank you Mary for answering these questions and helping us to become better acquainted with you and your story, Torn. Mary Brock Jones lives in New Zealand, but loves nothing more than to escape into the other worlds in her head, to write science fiction and historical romances. Sedate office worker by day; frantic scribbler by night. Her parents introduced her to libraries and gave her a farm to play on, where trees became rocket ships and rocky outcrops were ancient fortresses. She grew up writing, filling pages of notebooks and filling her head with stories, but took a number of detours on the pathway to her dream job. Four grown sons, more than one house renovated and various jobs later, her wish came true. She is published in both romantic science fiction and historical romance, and her books have been nominated as finalists in the RWNZ Clendon awards, the Koru awards, and the RWAus RUBY awards.